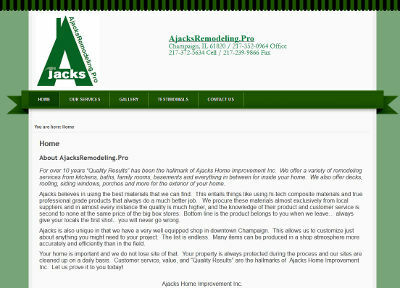 BsnTech Networks was contacted by Jack of AJacksRemodeling.Pro several months ago asking about website design services. Several items had happened and transitioned in his business – but he let us know a couple weeks back that he was ready to get started with his website. He went through a name change and some other items concerning his core business – and therefore wanted to hold off on the site until everything calmed down. AJacksRemodeling.Pro is a construction / home contractor in Champaign, IL and specializes in home remodels, home construction, bathrooms, kitchens, and much more. We appreciate the business from Jack and look forward to a long relationship with him as we also manage some other services and marketng for him! AJacksRemodeling.Pro’s website is at ajacksremodeling.pro.